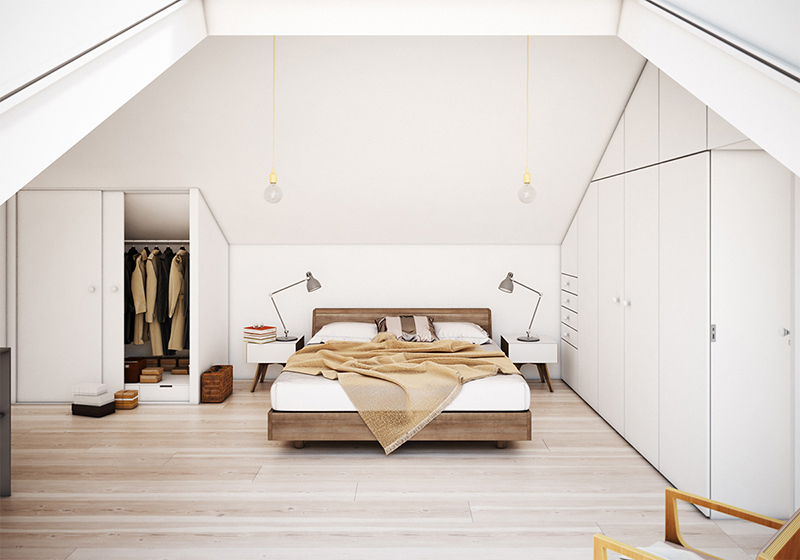 Need ideas for a bedroom attic? 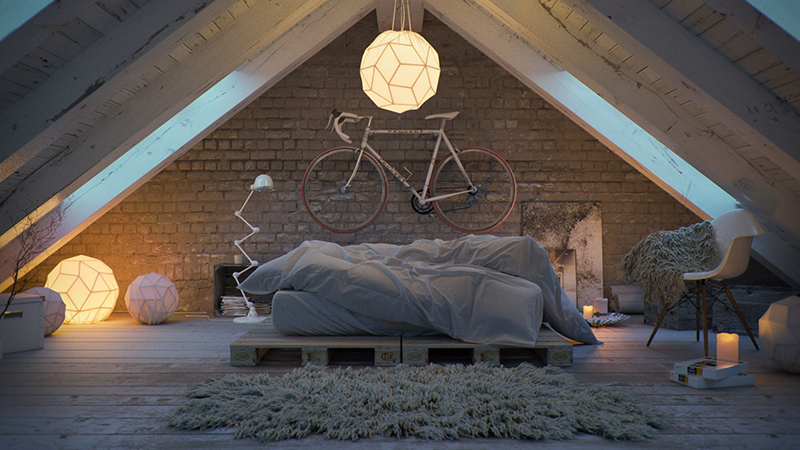 Here are impressive interiors from 3D artists. 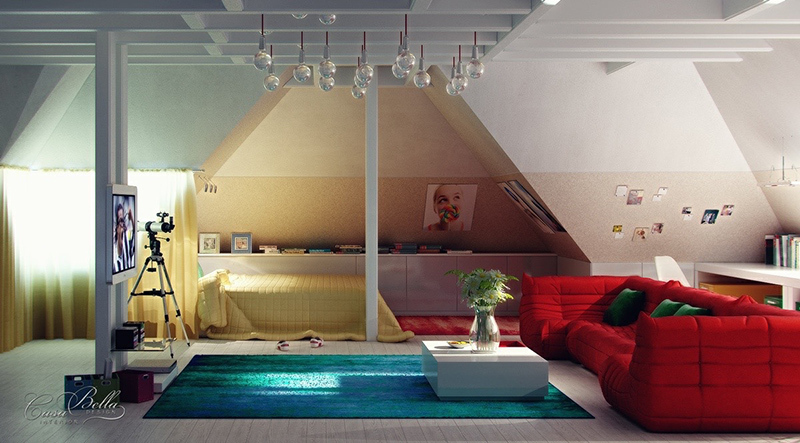 We can all recall that during our childhood days, we would dream to have our own attic where we can play and spend time with our siblings and friends. 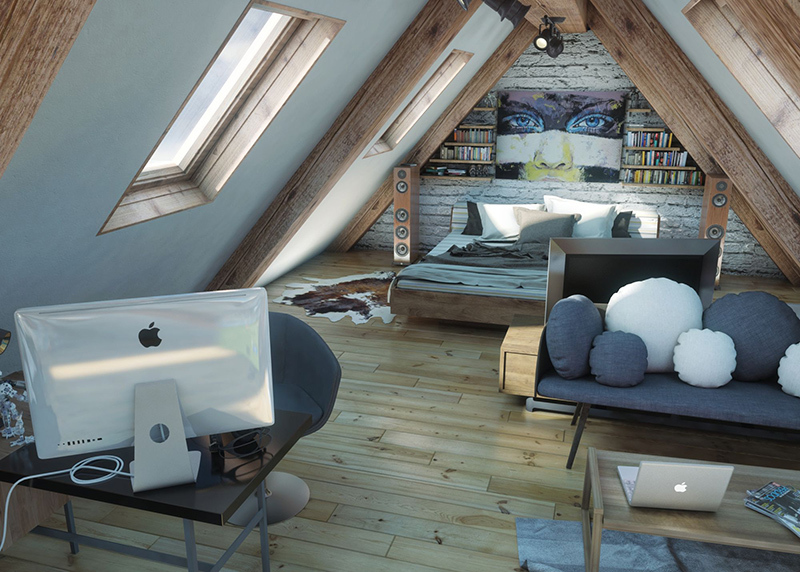 Having an attic as a bedroom or a play area seems nice because of the privacy we can get while in it and it seems like a cool idea to be at the topmost part of the house. But I am not sure if adults think the same way because attics would have a limited space in it. 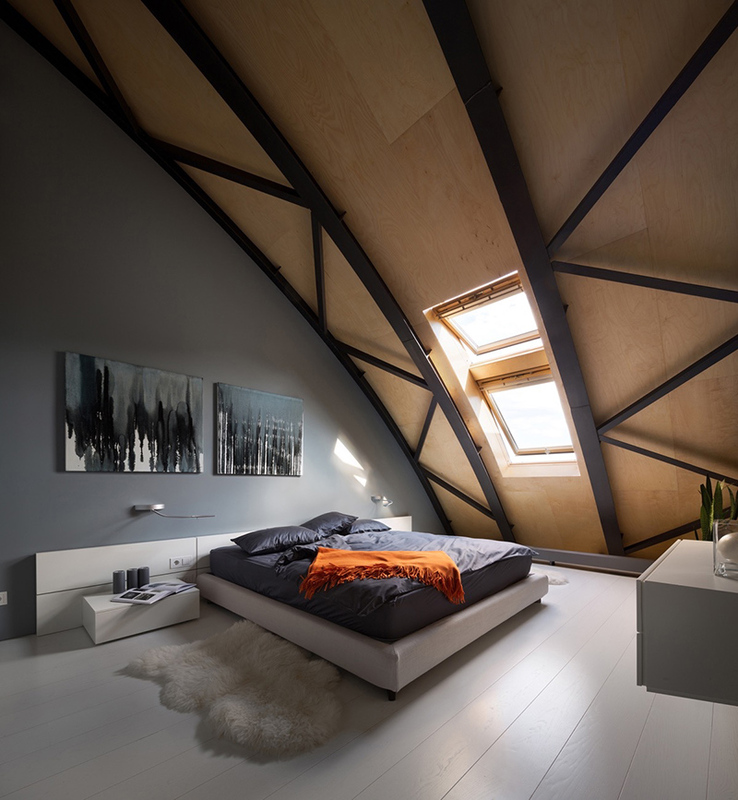 But then again, having a bedroom attic may sound nice especially that each space has unique architectural details in it like exposed wooden beams or maybe even windows with a unique shape. 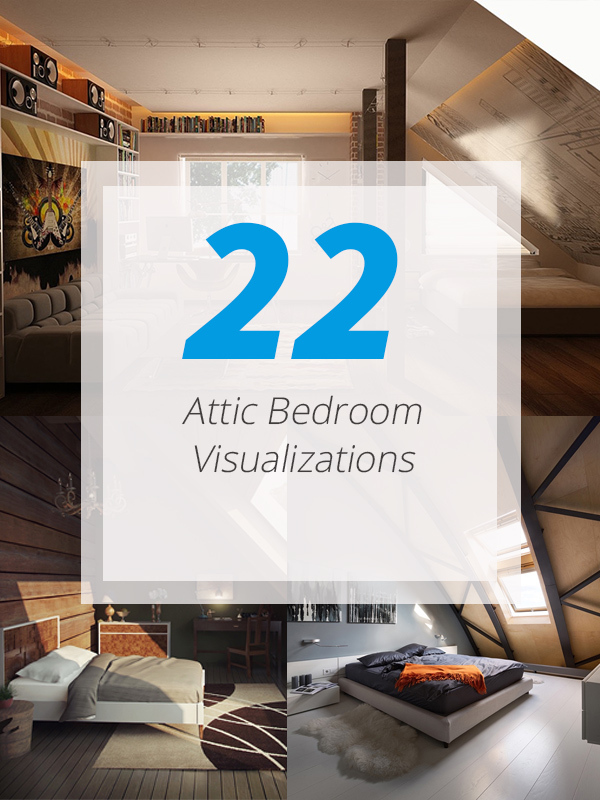 Today, we are going to show you visualizations of bedroom attics that look totally cool. 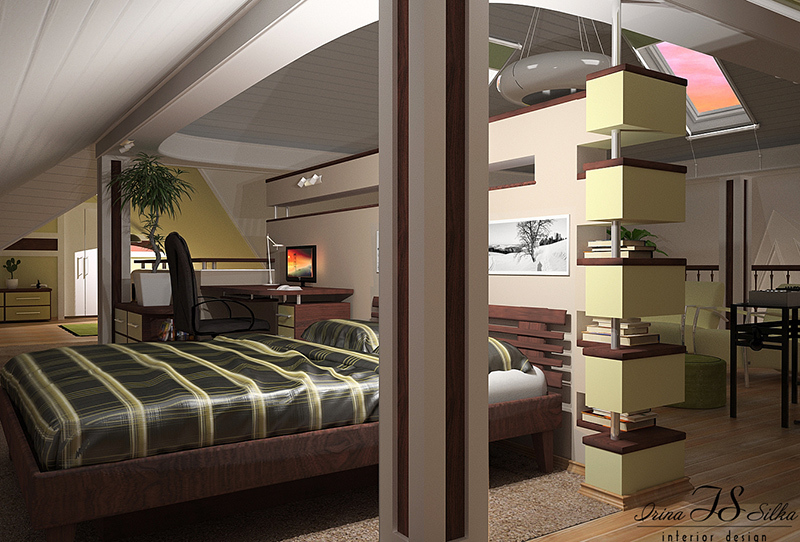 Once you start browsing through the images of the bedroom attic visualizations below, you can notice how each one is uniquely designed with splashes of colors and a variation of style. Like ordinary bedrooms, these spaces at the top of your home can also be decorated in a way that it can show your personality and design preference. And because of that, each one looked unique and very beautiful. 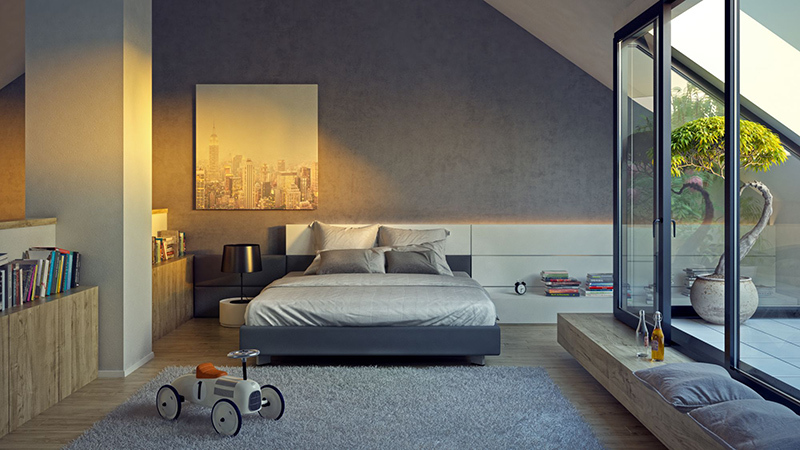 Let us scroll down at the images of the bedrooms below as done by 3D visual artists. This looks open and inviting with large windows featuring wooden floors. Notice that mostly are white and the only black in here are the inside of the windows and the wall mounted art above the gray bed. It also used white window covers to make it easy to shield out light. Totally striking, right? 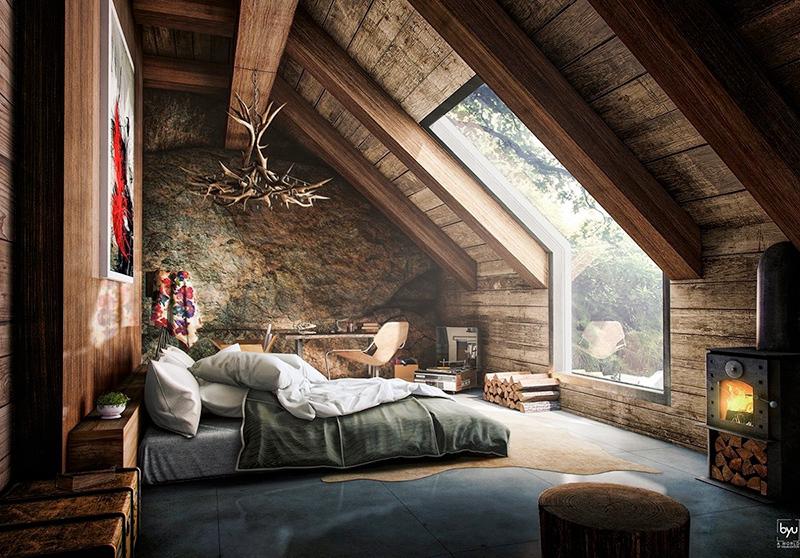 Well, whoever said that rustic is not beautiful will surely change his mind after seeing this attic room. It features a chandelier that is made from antlers and is lit up by the natural light that passes through a large window. There are wooden walls and a wood burning fireplace in here to make it cozy. This bedroom proves that simplicity is beauty. Its design is both dreamy and cozy as it invites air and natural light to the area through the large angled windows. It does looks like a perfect space for an introvert with books and a lovely acrylic lamp and black framed art piece that balance each other. This one has a lot of built-in storage which is a must when you have a strange shaped room. With a huge closet, everything is kept organize and it is clutter free. 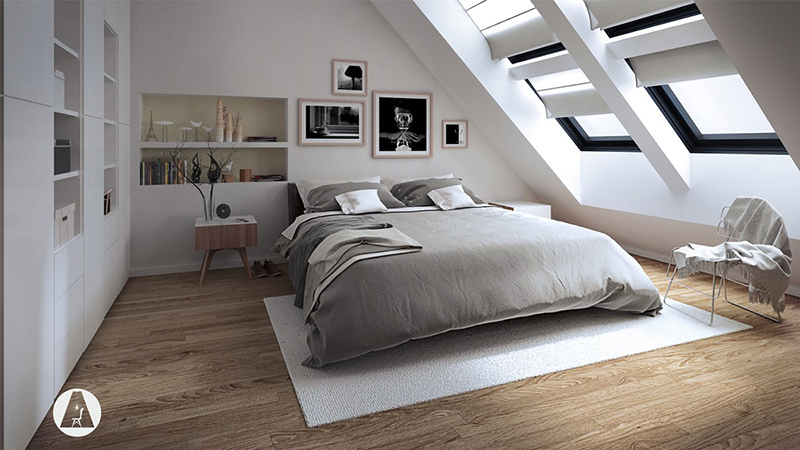 The natural wood used for the bed looks perfect with the gray reading lights and light wooden floors. There are also two lights with yellow cords that are hanging from the ceiling. 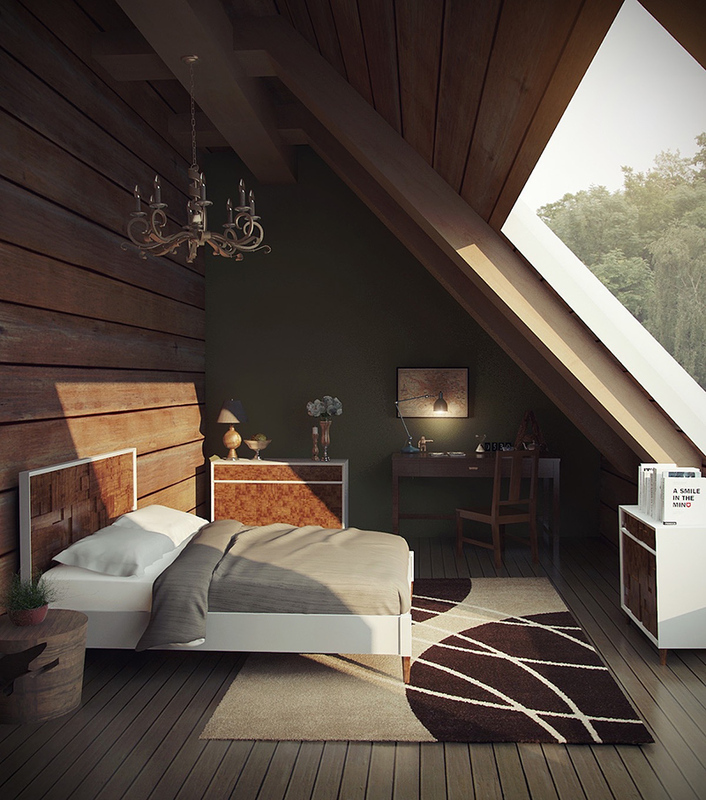 A chic attic bedroom that highlights the beauty of the sky. Perfect as a bachelor’s pad, it has tall ceiling and oversized windows. The black bed matched with the other black elements in the area. The narrow black metal lanterns used here give the room a masculine energy. 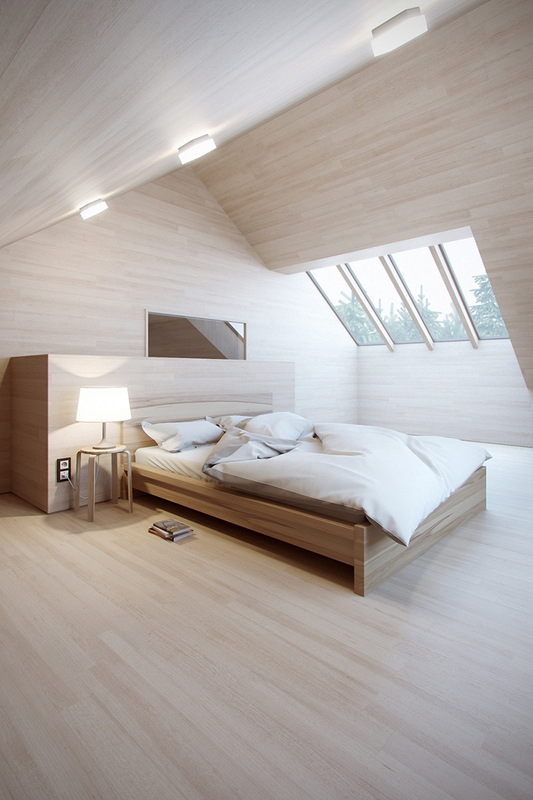 The wooden walls in this bedroom are lit up by the large angular window that brings natural light into the space. It is nice that a modern area rug was added into the bedroom that matches with the wooden accents. There is also a quaint desk tucked in the corner. 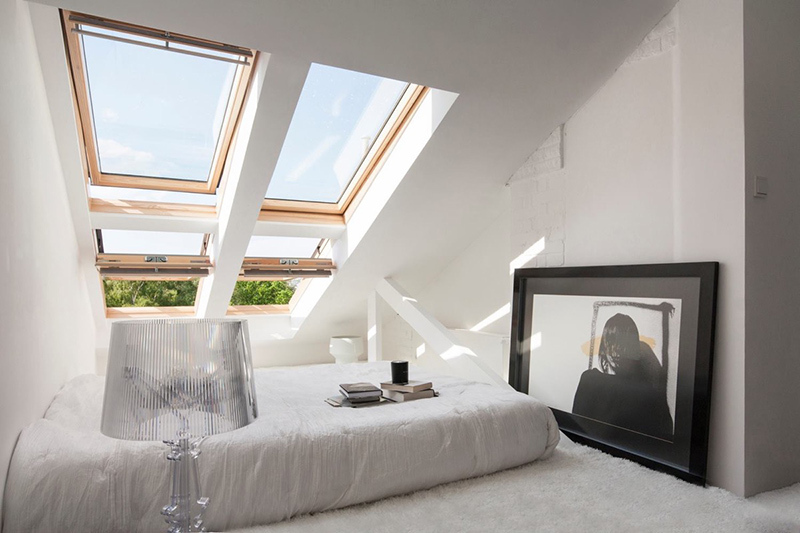 Isn’t this a very light and bright attic? Light wood grain is used for the area which added such lightness. Neutral colors are used in here too while one can take a look at the pine trees outdoors through the window. 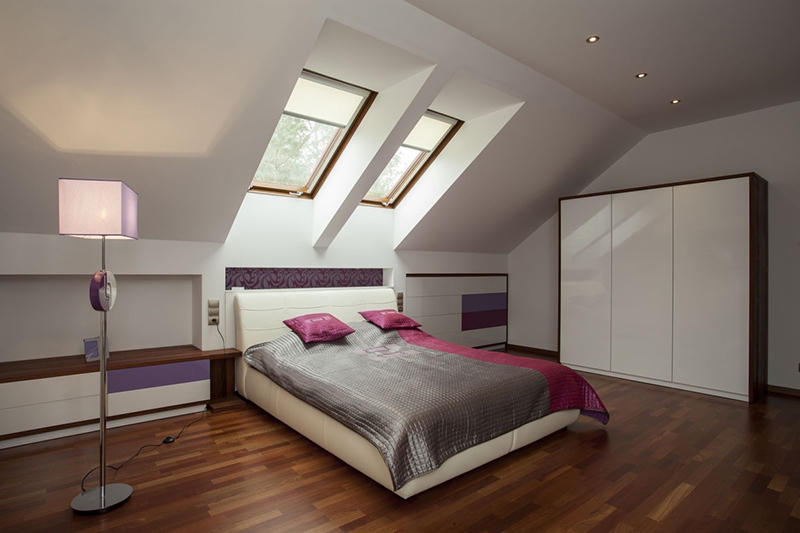 This is such a feminine and airy attic bedroom as it put together fuchsia and purple colors. There is also a slight pattern on the headboard part of the bed as well. Also seen here is a metal lamp that shines on the angled wall. Look at how artistic this bedroom is. Even if the area isn’t that big, they managed to make it appear really beautiful with wall murals. Aside from being a sleeping area, it is also intended for working and even for entertainment. 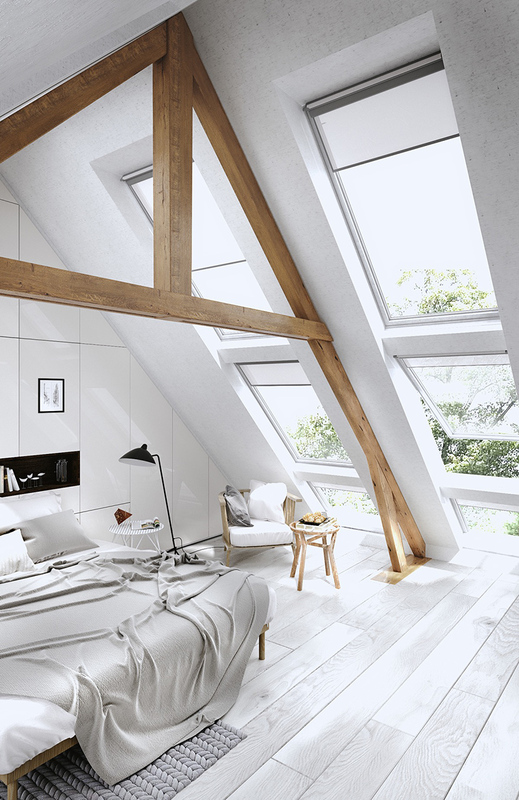 A stunning attic space with all white colors in it featuring exposed wooden beams that contrast against the white walls. The bed seen here is adorned with gray bedding and a black painted built-in bookshelf. The flooring is painted white while the beams are kept to its natural wood color. Such a creative attic indeed! It has many industrial lights in it that is hanging above the bed. You can see that there is a glass divider between the bedroom and the master bathroom. In the master bathroom, it has a freestanding tub and rectangular white sinks for a modern vibe. Who would think that a simple bare wood on the wall would look lovely in this space? Its white floor extends to the bed and the headboard while the textures are kept simple to draw attention to the accent wall. 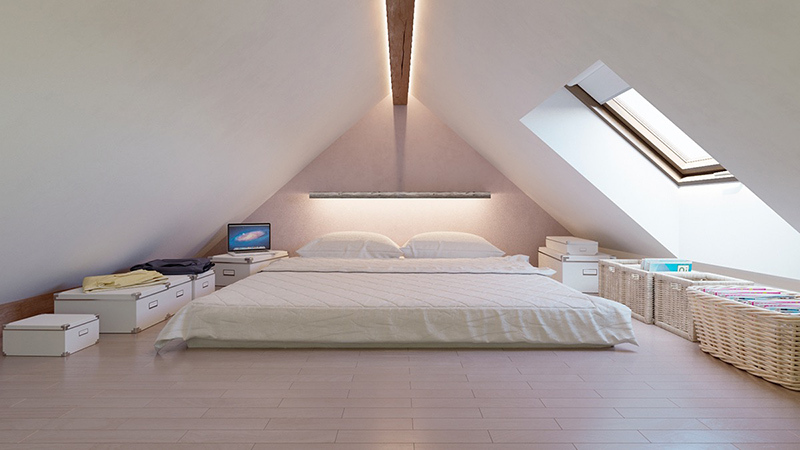 The architectural detail in this attic bedroom was illuminated just like the beam that runs the width of the room as well as the headboard part. Since they cannot add tall storage, they used baskets and white boxes in here. I can tell that this is a spacious bedroom since it was able to accommodate a large working area with a built-in desk as well as a floor-level lounge with a cow prints on the area rug. The storage spaces are added on the sloped part of the ceiling while a glass door leads to what appears like a balcony. 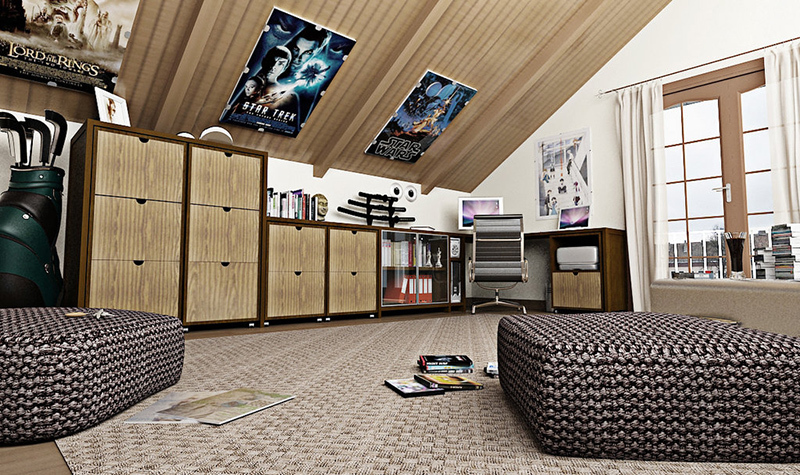 It is interesting to note that this bedroom added movie posters on the sloped part of the ceiling. It also used wood for its storage spaces and it has a black and white print for the ottoman. Aside from the lovely colors, what this attic has is unique lighting. The globe lights that are hanging from the ceiling look really beautiful and bring the trendy aesthetic to the bedroom. The focus in the space is the red couch with unique white beams on the ceiling. It is nice that this attic managed to get in a small balcony where there is a large plant in it. It is a good idea that glass was used to let natural light in the space. I also like the design of the bedroom with gray and white colors. 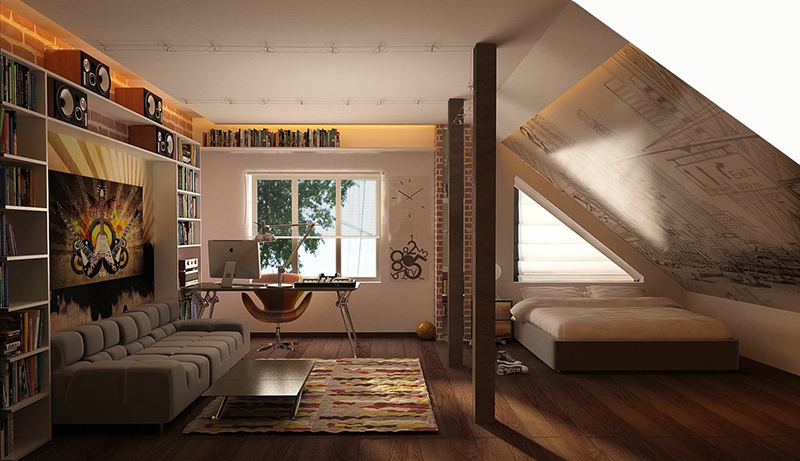 This attic looks formal because of its colors and the way it is designed. It is also very spacious too since you can see that there is a wardrobe on the other end. It also has a working area here as well. What I find interesting in the space is the design of the bookshelves. A simple modern bedroom with black and gray elements. It also has some pops of green in it too while you can see some light wood features around the space. 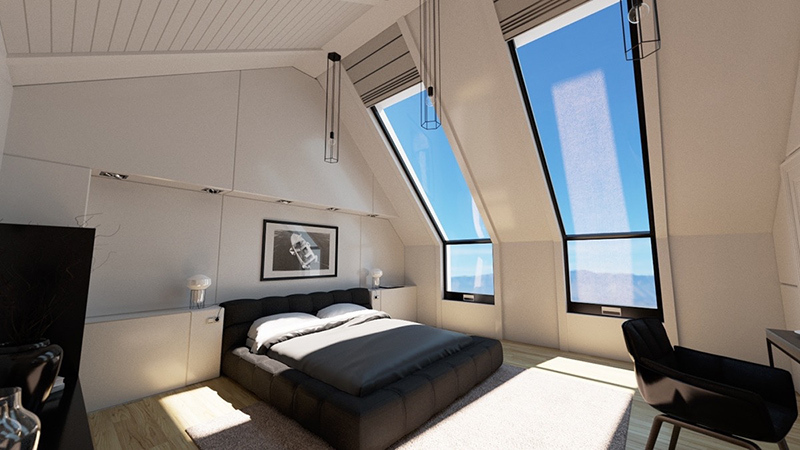 The bedroom receives natural light from the window. You can sense a rustic and industrial style for this space because of the exposed wooden beams and the brick walls. It is a good idea to add a wall painting in between floating shelves. It just looks so lovely! 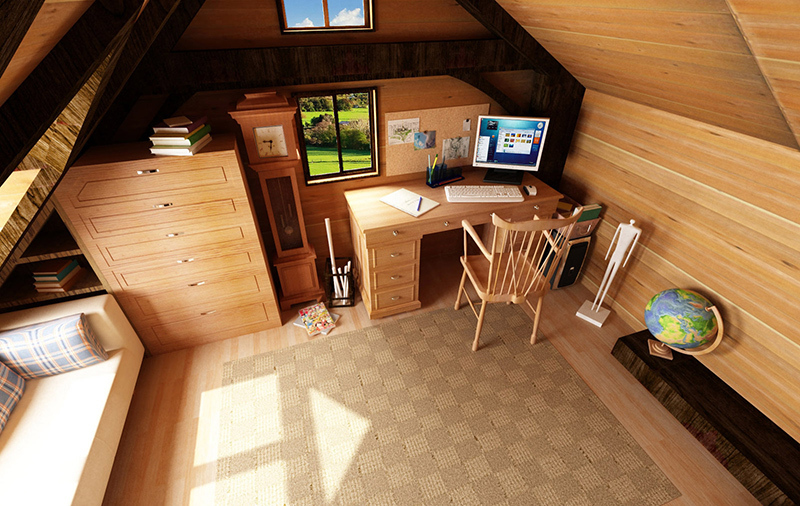 A small wooden bedroom attic has everything one needs from a small bed, storage spaces as well as a working area. Notice that it used two tones of wood in here which is a nice combination. This bedroom attic used pallet as its bed to elevate it from the wooden flooring. I like the industrial feel of the space as well as how it is illuminated by the unique facet pendant light, floor lights and candles. And yes, I love how that bicycle is kept too! These are all stunning! 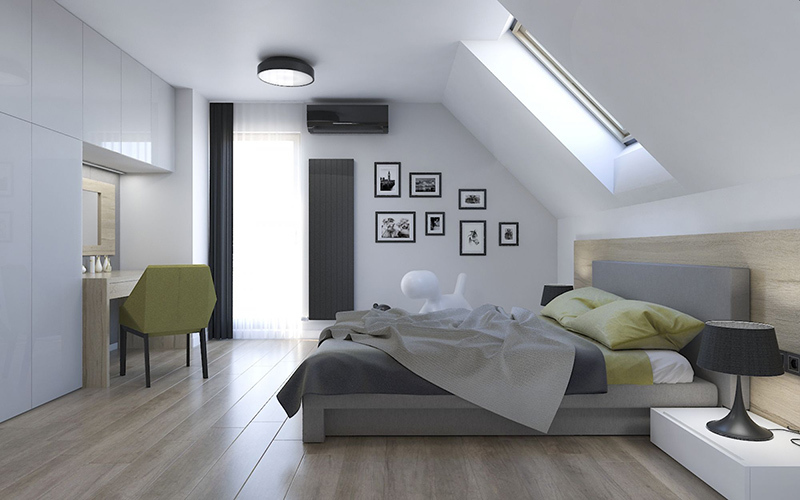 Yes, it sure is very challenging to design an attic because of its interesting shape but once you are done designing, you will surely feel happy about the result. One key to get a perfect design is to embrace the shape of the ceiling instead of looking at it as a hindrance to achieve the design that you like. 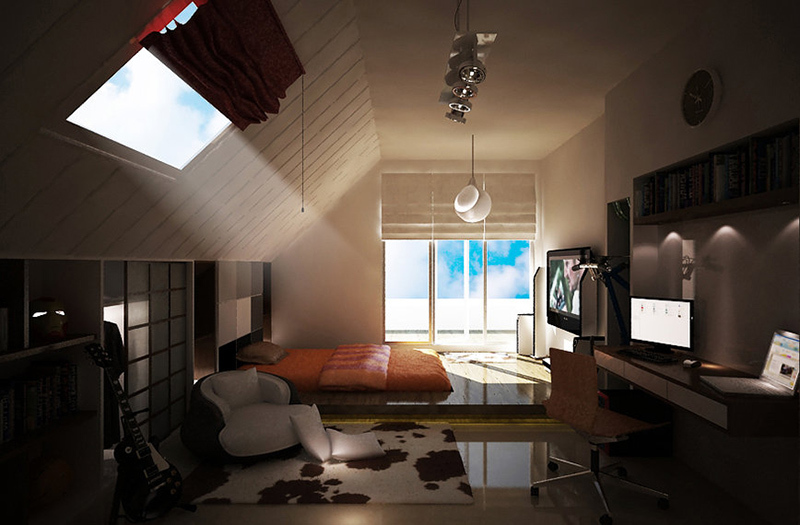 So, if you are currently confused on what to do with your bedroom attic, don’t be! Instead, look into this list and be inspired with how these areas are visualized. Of course, these are also possible in actual design. 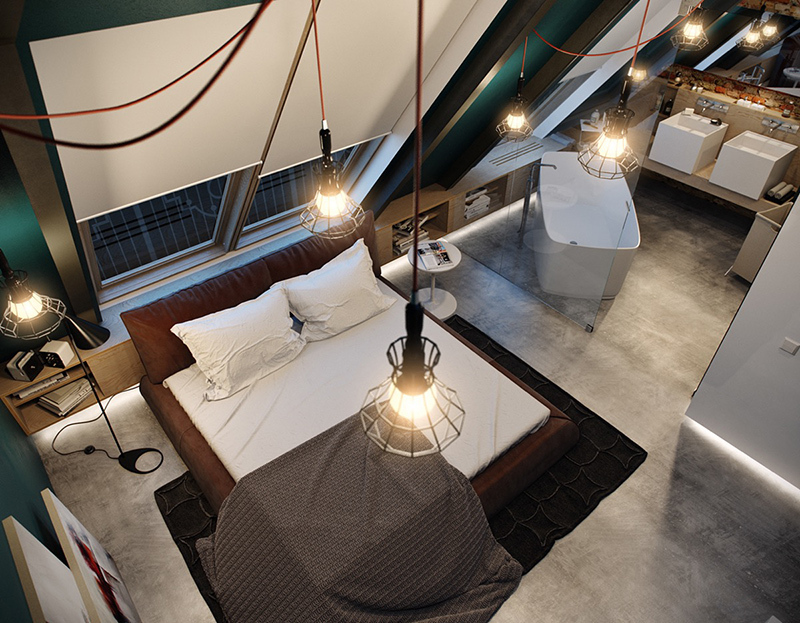 Now can you tell me which of the above bedroom attics do you like the most?